ON EARTH DAY 2010, LIBERTY SCIENCE CENTER will introduce ECO BOYS AND GIRLS: earth-friendly educational animated characters created by visionary top model and fashion designer, Maria Snyder, recognized for her green sensibility and innovative integration of recyclable materials into her designs. WHY: Maria Snyder explains, "I created these ECO Characters to give kids today 'ECO HEROES' to believe in, to havefun with and learn from. Children are aware, involved, caring and connected to the earth. I wanted to engage young people, empower them to take ownership of the world we live in and enjoy learning about the environment. 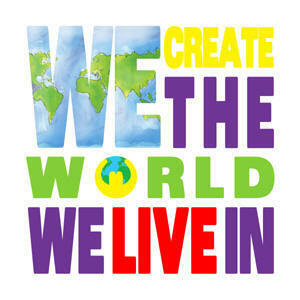 It's important that kids explore creative new ways to live in harmony with the planet. " WHO: MEET ERNIE EARTH - ONE OF MARIA SNYDER'S ECO BOYS AND GIRLS - Ernie's a serious, yet fun lovin’ down to earth guy, who is really looking forward to discovering and taking care of his whole self - the planet. He ventures inward and takes along his friends to explore. His likeness will be featured in the animated film and the bold large scale works of art by Maria Snyder on view for Earth Day 2010 at Liberty Science Center. WWW.LSC.ORG . Dedicated to offering exceptional science learning experiences onsite, offsite and online, Liberty Science Center engages learners of all ages in science excitement and actively connects people of all backgrounds to pivotal science and society issues. Saturday - Sunday 9:00 am - 5:00 pm. ADMISSION: $15.75 for Adults (ages 13+), Juniors (ages 2-12), Seniors (62+) $11.50; Teacher with ID ($5.00).